Guinea pig water bottles provide the best means of providing water to a pet rodent. Securely attached upside down to a cage, they can't be tipped over, and they ensure that water does not get contaminated by pieces of food, guinea pig hair or droppings. Sometimes they can drip, which can ruin bedding in the cage. Vacuum pressure is a common issue; you can generally fix a drip rather than resort to purchasing a new bottle. Remove the water bottle from the cage. Hold it with the drinking tube pointing upward and unscrew the lid counterclockwise. Remove the lid from the bottle and empty any remaining water from the bottle. Inspect the rubber washer that sits inside the lid where the tube enters. Take it out and bend it to see if it pliable or if it has become dry and brittle. Replace the washer with a new one if cracks are visible or if it has become brittle. A damaged washer will not create an airtight seal and will allow water to drip from the seal or from the feeder tube. Push a pipe cleaner through the tube to clean the inside of the tube and the metal ball that sits inside it. 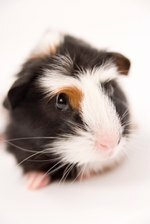 Ensure that no food particles are attached to the inside of the tube or the metal ball -- guinea pigs sometimes blow food particles out as they drink. Clean the bottle thoroughly while it is apart. Use a bottle brush and water to clean the inside. Make sure thatthe threads that join the lid and bottle are clear of any debris. Wipe the outside of the bottle and the drinking tube with a soft cloth. Fill the bottle with clean water. Squeeze the bottle while you put the lid on if you have a plastic bottle, as having a slight vacuum inside helps stop dripping. Ensure that the lid is on firmly, then turn the bottle upside down and reattach it to the cage.